What does PTSD and Magic Girls have in common? Yuki Yuna. This show has a unique reputation online as PTSD Magic Girls, and for a bit I was not sure what they were talking about. This show presents itself in such a manner that it's like watching a large pot of water boil. For the longest time the show was rather happy go-lucky. For eight episodes I trudged through this show, the characters were slowly developed and the cast was fully assembled. However, in terms of character substance they all sort of fell into the typical character tropes and never really emerged from them. The battles and fights were interesting and very colorful, and I couldn't help but get a reminiscent feeling of Evangelion in terms of monster design. Then everything began to boil over and the show finally revealed itself, and this is when it actually becomes interesting. The world in which these crazy things are happening are revealed, we get some more character development for one of our characters, and that nagging feeling of "this kinda reminds me of Evangelion" is vindicated somewhat for the characters face the harsh reality of what it means to be a hero. This show would be perfect, if the majority of it was focused on getting us attached to the characters. I was completely uninterested in them because they conform too much to the character stereotypes. I found only when things started to go sideways that at least two of the characters actually showed some real progression and change. If the show had sprinkled in small segments of psychological breaks, or cracks in the cheery facade that these girls robotically mimed through the first 8 or so episodes, it would of not only grounded the danger of what they were doing to be a real thing in their world, but it would of also brought in so much more depth to these characters than what they actually were. Let alone, the actual moments where these characters break would of been that much more impactful and believable. The full ending feels kind of like a cop-out, that the creators threw in there to keep this somber-ish turn from cutting too deep with their audience, and I feel hurts this show more than anything. The sacrifices that are displayed by these characters are all in vain, and it cheapens the earlier moments of heavy hitting emotional storytelling. Not to mention, even after everything is all said and done these characters return to their two dimensional cut-out tropes. The titular character of Yuki Yuna honestly develops the least in this show, and she seems to be more of a means to progress the story along and to cinch things up once the others have failed. After seeing this for myself, Yuki Yuna is indeed a Magic Girls PTSD show, but for everything that it does to throw that gut punch, it back pedals too hard and your left with the feeling of the creators trying to fix it all by applying a brightly color power ranger band aid to an inflamed abscess and calling it "donsies". "Yuki Yuna is a Hero" is a kind of anime that I've probably never seen before - the weird thing is, I'm not sure myself whether that is actually a compliment. The series, you see, is often compared to Madoka, and in a strange meta-twist, I feel that this comparison is essential for the show's success. Madoka is a deconstruction of the magical girl genre, and since we're expecting something similar from Yuki Yuna, the all too typical slice of life episodes and the sometimes predictable (if gorgeous) battle scenes do not faze us; we know that sooner or later a twist will come that'll turn things upside down. And in fact, it does. This tension and sense of expectation is vital; the show needs it because, frankly put, a whole lot of its first half (before the twist) would be utterly boring otherwise. The plot moves very slowly at first, although speeds up by the end. That doesn't mean that the early episodes are entirely full of needless filler, the things that are happening are usually happening for a reason, but man, does this show take its sweet time to get where it wants to be. Be careful of what you wish for, I guess...? Unfortunately, it's actually a bit misleading to say that they're the "main characters", because there's barely any other character worth mentioning in the entire show - not because the others aren't memorable, but because other people simply do not appear. Often you don't even see the faces of those the girls interact with, like their parents or teachers; the members of the Hero Club feel rather isolated during most of the series' run. This isn't necessarily something bad, but puts a lot of pressure on the main cast, who have to carry the show on their shoulders entirely. Sometimes it works, sometimes it doesn't - the slife of life parts of the series tend to suffer the most. As for the action, the battle scenes are done quite well and can be a thrill to watch. The twists the girls discover about their enemies and their own powers are interesting. The main weakness of this part of the show is the opposition: even after getting an explanation for their existence, I could not help but feel that the enemies pretty much act the way the producers want them to at any given moment, without much logic or, God forbid, motivation. Their strengths, weaknesses and abilities seem to have basically no consistency whatsoever - they're little more than a plot device, really. The ending itself suffers from the same problem: all the established rules about the girls' powers are thrown out the window in order facilitate a happy ending. Make no mistake, I like happy endings, but I like happy endings which make sense even more. A little explanation would have gone a long way. I'm not sure who I can recommend Yuki Yuna to. As a generic magical girl show, it's perhaps a bit too dark, although not overly so. (It's certainly not for kids though.) As a deconstruction of the genre, it sort of works, but leaves some doubts about what it actually wanted to accomplish. I'll have some fond memories of the characters, but not of the anime as a whole. This anime surprised me! And in a good way! When I first decided to watch this anime, I didn't expect it to be THAT GOOD! The same way I thought when I started watching Madoka Magica, although I can't compare them too much together. They have completely different stories, and they both executes them well. I really hope there will come more work like Madoka and YuYuyu. It's been compared to Madoka since Episode 1. But as the story progresses, it becomes pretty clear that the producers've intentionally made it similar to play with audience expectations. The result is a well-paced, high-tension anime that somehow manages to balance super serious action mahou shoujo and blissful slice-of-life. And that kind of hybrid actually works really well together! When the show gets dark, the characters keep their heads up by being there for each other. That's good stuff, and the perfect anchor for when the show gets really emotionally demanding into the latter half of its run. Yuki Yuna isn't about how these girls solve plot problems, but rather how they react and cope with being given such a heavy responsibility. Take the time to get to the end. So, I really liked the show, but I did not outright love it. Some parts I felt dragged a little, even if they were significant, and somehow this doesn't feel as memorable enough to rate a full 5 stars (even if it is much better than average). On the one hand, good for the show to deal with physical disabilities. On the other hand... the ending sort of wipes everything away too cleanly, and at the same time doesn't deal with the real problem? I mean, I don't want the girls to be hurt, but... gah, it's hard to explain. Fitting name for one of the season's great surprises. Gen Urobuchi's Madoka Magica introduced a whole new way to write Mahou Shoujo. One that along with being bright, happy and cute, could also be dark, sad and made you wish more than anything that the characters involved would get their happy ending. It's nice to see the new generation of the Magical Girl genre still going strong with shows like this one. Yuki Yuna is a Hero, (or as it's also cleverly named; Yuki Yuna wa Yuusha de aru) is more than anything a show where you need to care about the characters. Luckily all the girls are very likeable and the show gives a lot of room for normal interactions between all of them to let you get to know them. This ties into the later half of the story where your feelings for the group will decide just how powerful the developing plot is. Next there's the visuals of the show. I really liked the art style they used in both the normal and combat situations, enjoyed the designs of the girls in their everyday lives and absolutely adore the character design of the magical girls. There's just something about them that sets them apart from the magical girls of other shows. The animation is consistent and they did a great job showing the emotions of the characters. I'm also fairly impressed by their use of CGI though nothing too major. The music is also pretty impressive. The opening and ending were both nice but nothing else. The songs used during everyday and emotional scenes were fantastic. But the true musical star of this show is the soundtrack used during action scenes and I'm sure you'll know what I mean after hearing it once. It just has this massive sense of scale that captures my interest the moment it starts playing. The voice acting too was rather nice with Fu and Togo ranking higher than the rest because of how much emotional strain they go though in the story which Yumi Uchiyama and Suzuko Mimori did a remarkable job of pulling out. 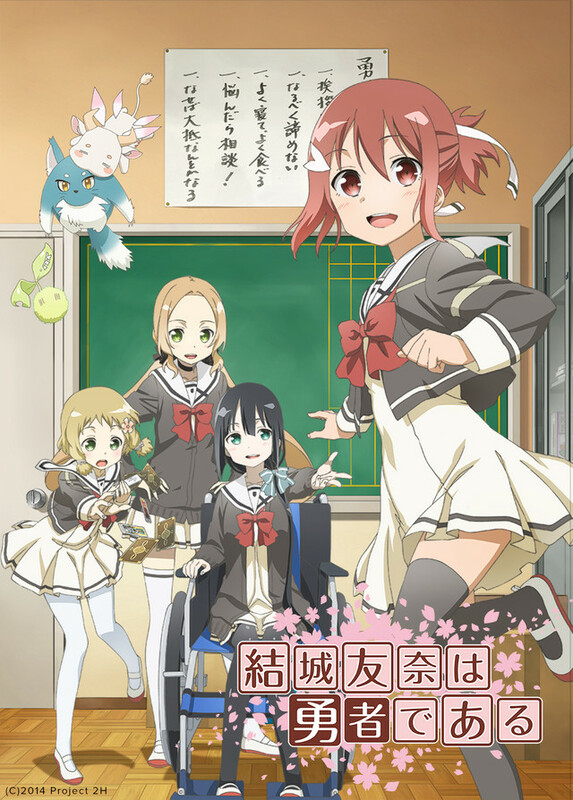 Yuki Yuna is a Hero is one of the surprise titles of the Fall Season 2014 and I'm really glad I decided to add it to my watch list at the start of the season!